Every so often a new article pops up about the inherent goodness of the capsaicin in chillies. For me this is just stating the obvious, like stating the earth is round and not flat or that man-made carbon dioxide is irrelevant for global warming. To like chillies is to like sunlight and brightness. There are few dishes or sauces which cannot be improved by the judicious addition of fresh green chillies, fresh red chillies, dried red chillies or even – for the hard-pressed urbanite – chillie powder. From a pinch of chopped green chillies in salads or chillie flakes on pizzas (which ought to be mandatory) or a few drops of “hot oil” on all pasta dishes or chillie infused olive oil for dressings and sauces, virtually every cuisine can be improved. No barbecue ought to be allowed without a hot sauce (though the overuse of vinegar with red chillies should be outlawed). Brazilian churascarias usually do have sharp, fresh ginger and often have wasabi but could well do with having more chillies available. Traditional European cuisine (especially Eastern Europe) was long ignorant of the virtues of chillies. It was like the mathematics Europe had without a symbol for zero. They are learning now. English “cuisine” has changed immeasurably – for the better – only since the proliferation of curry houses. French cuisine is only just beginning to learn how to use chillies. It seems ridiculous to have a Michelin starred chef who does not know how to use chillies. As anyone who has ever eaten a really hot chilli will testify, they can cause a lot of pain. Chillies come in many shapes, colours, sizes and strengths, but one thing they have in common is the burning sensation they cause in your mouth, eyes and any other part of your body into which their juices come into contact. Although most people think that the hottest part of a chilli is its seeds, in fact it is the white spongy layer you find inside, called the placenta. Bite into this and you will really feel the burn. That burning sensation is mainly caused by a chemical called capsaicin, which is found in tiny glands in the chilli’s placenta. When you eat a chilli, the capsaicin is released into your saliva and then binds on to TRPV1 receptors in your mouth and tongue. The receptors are actually there to detect the sensation of scalding heat. Capsaicin makes your mouth feel as if it is on fire because the capsaicin molecule happens to fit the receptors perfectly. When this happens it triggers these receptors, which send a signal to your brain, fooling it into thinking that your mouth is literally burning. The reason why wild chilli plants first started to produce capsaicin was to try and protect themselves from being eaten by mammals like you. From an evolutionary perspective the plant would much rather have its seeds dispersed far and wide by birds. Oddly enough birds, unlike mammals, don’t have TRPV1 receptors, so they do not experience any burn. So producing capsaicin turned out to be the ideal way to deter mammals from eating the plant while encouraging birds to do so. But then along came an ape with a giant frontal cortex who somehow learnt to love the burn. …… In a recent study done by researchers from the University of Vermont they looked at data from more than 16,000 Americans who had filled in food questionnaires over an average of 18.9 years. During that time nearly 5,000 of them had died. What they found was that was that those who ate a lot of red hot chillies were 13% less likely to die during that period than those who did not. This supports the finding of another recent study, carried out in China, that came to similar conclusions. So why might eating chillies be good for you? 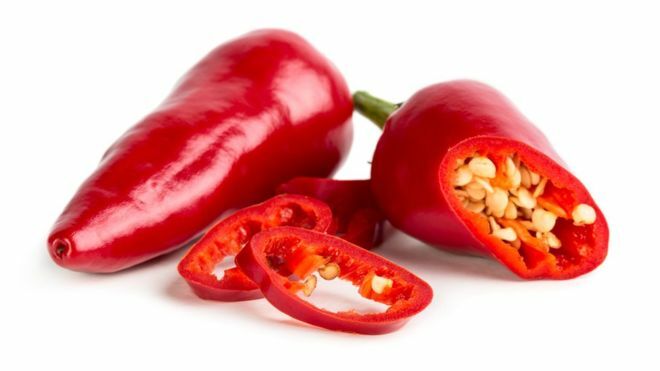 The researchers speculate that it could be that capsaicin is helping increase blood flow, or even altering the mix of your gut bacteria in a helpful direction. Posted in Medicine, Politics, US | Comments Off on As costs go up in flames, time to pull Obamacare off the market? Old codgers like me will remember the 1965 science fiction film “Fantastic Voyage” where a medical team in the submarine “Proteus” are shrunk to microscopic size and are injected into the vessels of a brain-damaged scientist to try and save him. The ship is reduced to one micron in size but the miniaturisation is temporary and they will revert to normal size after one hour. Naturally the team contains one bad guy. But the most memorable part of this film is that Raquel Welch is one of the team (an assistant). While life expectations have been increasing across the globe, the time spent suffering from Alzheimer’s and other forms of dementia have also been increasing. In the last decade this increase has not been checked by any breakthroughs in drugs to brake the onset of, or reverse the progression of, dementia. 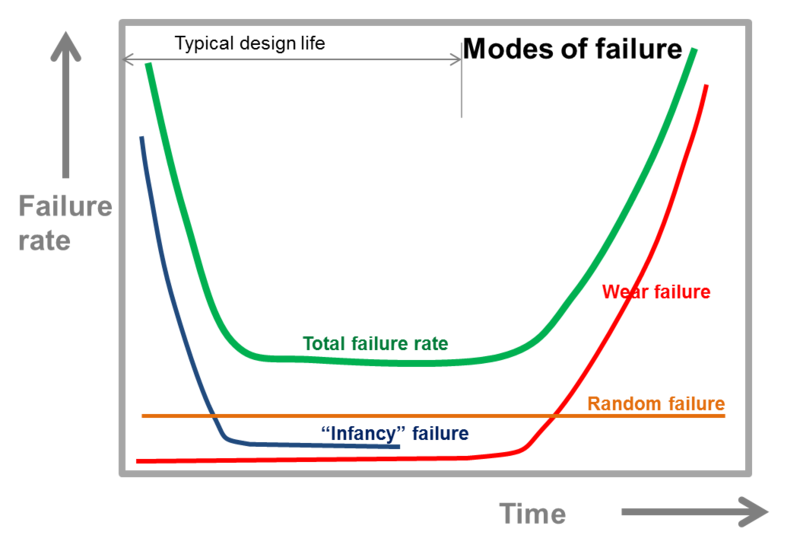 While life expectancies are approaching 90 years, the period at the end of life with serious disability is approaching 10 years. Among the elderly there is now a greater fear of the degradations at the end of life than of the end itself. Now, the IL-33 protein is showing the potential of actually reversing some of the symptoms of Alzheimer’s. Injections of the protein succeeded in restoring the memory of mice which had been debilitated by an Alzheimer’s like affliction. The potential is that injections – if the protein acts in a similar way with humans – could restore the memory of Alzheimer’s patients within a week. It is hoped to start clinical trials by the end of the year and that could leave to approved drugs becoming available within 5 years. 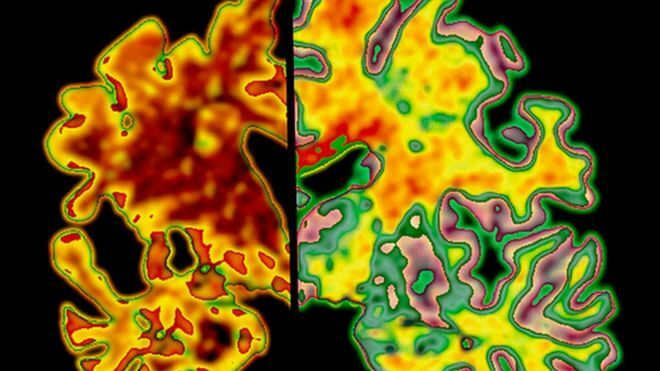 A protein which can reverse symptoms of Alzheimer’s disease in mice could provide a key to potential treatments, Scottish scientists said. The IL-33 protein is produced mostly in the nervous system but patients with Alzheimer’s had less IL-33 than people without the condition, he said. The study, published today in Proceedings of the National Academy of Sciences USA (PNAS), also found the IL-33 curbed the inflammation in the brain tissue, which has been shown previously to increase plaque and tangle formation. IL-33 is made in the body and the highest concentrations are found in the brain and the spinal cord. Those with Alzheimer’s have depressed levels. Alzheimer’s disease is widely believed to be driven by the production and deposition of the β-amyloid peptide (Aβ). The IL-33 protein is thought to activate the body’s immune system which in turn attacks the β-amyloid which causes the characteristic Alzheimer’s plaque. A new paper by Nobel winner Angus Deaton and his wife Anne Case points out a trend reversal and a sharp increase of mortality rates among 45-54 year old, non-Hispanic whites in the US between 1999 and 2013. This is highest among the less educated, less well-off population. It is the reversal of a previous trend and that is both perplexing and a little alarming. It suggests a deeper social malaise prevalent in this group. A rather deadly – and morbid – case of “White Flight”. This paper documents a marked increase in the all-cause mortality of middle-aged white non-Hispanic men and women in the United States between 1999 and 2013. This change reversed decades of progress in mortality and was unique to the United States; no other rich country saw a similar turnaround. The midlife mortality reversal was confined to white non-Hispanics; black non-Hispanics and Hispanics at midlife, and those aged 65 and above in every racial and ethnic group, continued to see mortality rates fall. This increase for whites was largely accounted for by increasing death rates from drug and alcohol poisonings, suicide, and chronic liver diseases and cirrhosis. 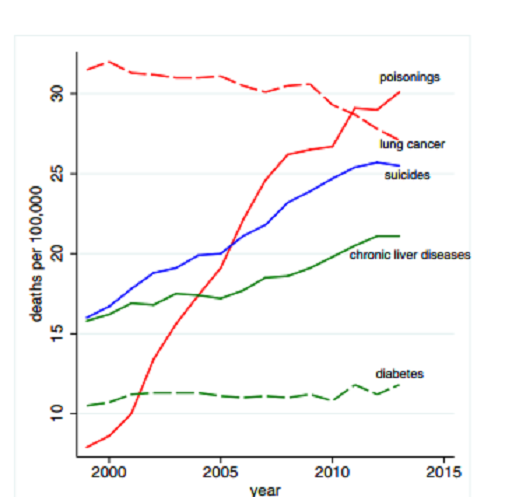 Although all education groups saw increases in mortality from suicide and poisonings, and an overall increase in external cause mortality, those with less education saw the most marked increases. The sharpest increase has been in “poisonings” which is essentially the use of drugs (including pain related opiates) and alcohol. Mortality by cause, white non-Hispanics ages 45–54. Case and Deaton’s data indicate that the white midlife mortality reversal was due almost entirely to increased deaths among those with a high school degree or less. Mortality rates in that group rose by 134 per 100,000 between 1999 and 2013, while there was little change among those with some college, and death rates fell by 57 per 100,000 for those with a college degree or more. 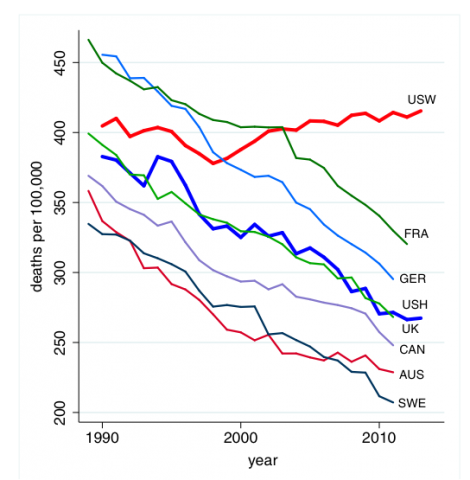 Death rates from suicide and poisonings such as drug overdoses increased among middle-aged whites at all socioeconomic levels (as measured by education). But the increases were largest among those with the least education and more than sufficient in that group to wipe out progress in reducing other causes of death. Deaths from diabetes rose slightly but did not account for a significant part of the white midlife mortality reversal. ……. Among blacks, midlife mortality has been higher than among whites. But over the period 1999-2013, according to Case and Deaton, midlife mortality declined by more than 200 per 100,000 for blacks while it was rising for whites. As a result, the ratio of black to white mortality rates dropped from 2.09 in 1999 to 1.40 in 2013. Contrary to what many Americans may still believe, drug overdoses are no longer concentrated among minorities; in fact, among the 45-54 age group, drug-related deaths are now higher among whites. …..
American Prospect goes on to suggest that this might be a loss of hope among the white, middle-aged, less educated population, which is part of the malaise which is showing up politically as support for Trump and Carson. The declining health of middle-aged white Americans may also shed light on the intensity of the political reaction taking place on the right today. The role of suicide, drugs, and alcohol in the white midlife mortality reversal is a signal of heightened desperation among a population in measurable decline. …… The phenomenon Case and Deaton have identified suggests a dire collapse of hope, and that same collapse may be propelling support for more radical political change. Much of that support is now going to Republican candidates, notably Donald Trump. Whether Democrats can compete effectively for that support on the basis of substantive economic and social policies will crucially affect the country’s political future. We have probably gone a little too far and are just a little too protective of our children. The cleaner we try to keep everything around children, the less developed is their immunity and the more vulnerable they become later. I suspect it is the same thinking which has meant that we have also gone too far with so called Health and Safety provisions in schools which – for fear of accident and resulting liability – has reduced the fun – and the learning opportunities – of play, sports and excursions. The so-called precautionary principle (which is no principle but a political ideology) actually encourages actions to be subservient to fear. There is a difference between avoiding being foolhardy and being cowardly. A Swedish cohort study on over one million children has found that early exposure to dogs clearly reduces the later risk of asthma. Uppsala University press release (in Swedish) is here. “Earlier studies have shown that growing up on a farm reduces a child’s risk of asthma to about half. We wanted to see if this relationship also was true also for children growing up with dogs in their homes. Our results confirmed the farming effect, and we also saw that children who grew up with dogs had about 15 percent less asthma than children without dogs. Because we had access to such a large and detailed data set, we could account for confounding factors such as asthma in parents, area of residence and socioeconomic status” says Tove Fall, Assistant Professor in Epidemiology at the Department of Medical Sciences and the Science for Life Laboratory, Uppsala University, who coordinated the study together with researchers from the Karolinska Institutet in Stockholm, Sweden. ……. I suppose they do do some good, but they also make some horrible blunders as with the UN introduced cholera epidemic in Haiti, or with the initial downplaying of the Ebola outbreak in some African countries, or when their panel members take money from vaccine manufacturers to recommend mass flu vaccination programs. As with all UN organisations the staff are a mixture of professionals, surrounded by bureaucrats with political agendas from their home countries, and with some members from partisan lobby groups who promote their own causes and self-interests. WHO panels which recommend certain drugs or mass vaccination programs always seem to contain members with commercial ties to the pharmaceutical industry. Many in the WHO justify their alarmist tactics as a means to stimulate or trigger actions and – inevitably – many of these actions are totally unnecessary (but they are often very lucrative for some members of the WHO and their sponsors). Now the WHO are going after processed and even red meat as causing cancer. But they have had to torture their data to calculate the risk. They forget that living is risk. Not being born, however, carries no risk of dying of anything. 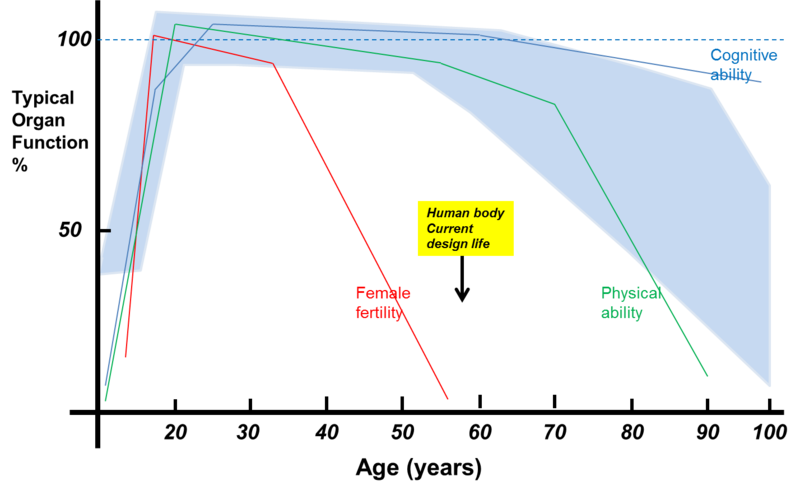 Therefore, the risk of cancer due to being born is far, far greater than that introduced by any other parameter or substance. I won’t be changing my meat eating habits just yet. Their list of 116 other things – besides birth – that increase the risk of cancer are taken from the Daily Mail. First antioxidants were good for you, then they were of doubtful benefit and now it seems they are positively bad. Many foods containing antioxidants have been touted for their health benefits and have included chocolate, fresh fruits and vegetables, nuts, whole grains, maize, legumes and eggs. Red wine was on the list but the benefits of Resveratrol have already come under a cloud for alleged data tampering. Of course, perceived antioxidant benefits have not much influenced my own consumption of dark chocolate and red wine. But what the study finds is that “the overall conclusion from the various studies is that antioxidants protect healthy cells from free radicals that can turn them into malignancies but may also protect a tumor once it has developed”. So antioxidants can help prevent a cancer developing, but once the cancer is there antioxidants can speed up the progression of the cancer. Dark chocolate and red wine therefore remain on the “good foods list” for those who do not have any cancerous cells. Experiments on cell cultures from patients with malignant melanoma confirmed the new results. “We have demonstrated that antioxidants promote the progression of cancer in at least two different ways,” Professor Bergö says.